Cheshire, Greater Manchester, Lancashire and Merseyside. Independent local family owned Pub. Dogs Welcome on leads. Well behaved dogs welcome all day. All dogs welcome in the bar area. Cosy warm welcome and atmosphere. Water and doggy treats available and staff happy to accommodate a main menu meal in dog form. Lovely area for walking, with ample open fields on the Cheshire cross country walk. Beer garden and patio for the summer months but dogs must be on a lead as this is a fantastic family friendly pub. Merlin the resident collie is a very friendly play mate for everybody’s four legged friend. A Robinson’s pub serving Good Food, Good Beer and Good Cheer. 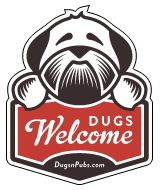 Dogs are welcome inside the pub as well in our extensive beer garden, playground area and outside patio area. Gravy bones available for well behaved dogs – an occasionally (if the dogs are extra cute) a slice of freshly roasted beef on a Sunday!! There are a total of 53 dog friendly listings in the North West category. Please log in, or sign up as a member to view all listings.